604 pages | 98 B/W Illus. Introduction. Phytopharmaceuticals: Challenges and Opportunities. Globalization of Traditional Medicine under Modern Medicine Portfolio. Illness to Wellness: Paradigm Shift in Disease Prevention. Single Herb-Based Therapies. Role of the Ayurvedic Medicinal Herb Bacopa Monnieri in Child and Adolescent Populations. Efficacy of Black Cohosh Medicines for Treatment of Menopausal Symptoms. Therapeutic Applications of Fenugreek. Pine Bark Extract. Nelumbo Nucifera. Multi Herbs-Based Therapies. ADHD: Safety, Efficacy, and Therapeutic Potential of Combination Therapy. Botanical Drugs as Emerging Strategy in IBD. Herbal Medicines in Viral Diseases. Botanical Polyphenols against Stress-Induced Depression and Cognitive Impairment. Marketing and Product Positioning. Science to Business Viability. Clinical Trial Protocols for Herbal Drugs – Perspectives of India. Safety Assessment and Toxicological Evaluation of Herbal Medicine. Pharmaco-Vigilance Study of Herbals. Regulatory Categorization. Medical Foods in Food-Drug Interphase. Personalization: An Emerging Platform of Clinical Research and Application. Dynamic Regulatory Perspective of Complementary and Alternative Medicine around the World. Regulatory Challenges for Clinical Research in Herbal Medicines. New Journeys through Categorization. Evidence-Based Approaches for Drug Development from Ayurveda. Phyto-drugs Useful in Antimicrobial Resistance. TCM and its Perspectives for Development Promotion. Future Trends. Botanical Marijuana vs. Synthetic Cannabinoid Drugs. New Perspectives on Innovative Drug Discovery. Integration of Traditional Medicine in Healthcare Systems. 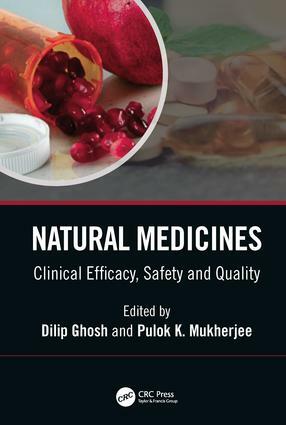 Development of Safe and Effective Botanical Drugs. Metabolomics Studies for Medicinal Plants. Dilip Ghosh, PhD, FACN is an international speaker, facilitator and author and professionally associated with SOHO-Flordis International (SFI), Australia; Honorary Ambassador, Global Harmonization Initiative (GHI), University of Western Sydney. He received a PhD in biomedical science from the University of Calcutta, India along with a BSc (Hons) and MSc degrees in Zoology/Microbiology, MPhil in Environmental Sciences.With more than 20 years of experience in both pharmaceutical and food-nutrition industries, he is one of the pioneer researchers in the evaluation of the health claims opportunities of potential functional food ingredients & complementary medicines through an evaluation of the current scientific evidence base and related claims, and provides commentary on gaps in science including potential requirements for research such as human studies.Dr. Ghosh has published more than 70 papers in peer reviewed journals, numerous articles in food and nutrition magazines and books. His recent books, "Biotechnology in functional foods and nutraceuticals", "Innovation of healthy and functional foods" & "Clinical aspects of functional foods and nutraceuticals" by CRC Press have been published in 2010, 2012 & 2014, respectively. Dr. Ghosh is Review Editor, Frontiers in Nutrigenomics (2011 to present), American Journal of Advanced Food Science and Technology (2012 to present), J of Obesity & Metabolic Research (2013 to present), J of Bioethics (2013 to present), Associate Editor & member, Toxicology Mechanisms and Methods , Taylor & Francis, USA (2006-2007), Columnist of The World of Nutraceuticals, USA. Professor Pulok K. Mukherjee, PhD is working as the Director, School of Natural Product Studies, Jadavpur University, Kolkata, India. His research/academic works highlights on traditional medicine inspired drug discovery from Indian medicinal plants to make them available from ‘Farm to Pharma’. His research career has been outstanding, including globally acclaimed contributions on teaching and research on validation of medicinal plants from India systems of medicine, their formulation and standardization, which are useful bio-prospecting tools for the traditional medicine based drug discovery programme. He has to his credit more than 200 publications in peer reviewed impact journals, several patents and 22 books/book chapters. His research publications have cumulative Impact Factor of 210; h-Index- 47, i10-index - 161; which has been cited for over 10380 times. Dr Mukherjee is serving as Associate Editor of the Journal of Ethnopharmacology, Elsevier Science. He is the member of the editorial board of several International journals including Phytomedicine, Life Science, Pharmaceutical analysis, Synergy; Phytochemical Analysis, World Journal of Traditional Chinese Medicine and many others. Dr Mukherjee has been awarded with so many laurels from Govt. of India and abroad; to name a few: awarded with the prestigious Commonwealth Academic Staff Fellowship from Association of Commonwealth Universities [ACU], UK; TATA innovation fellowship, by Department of Biotechnology, Govt. of India; Outstanding Service Award from Drug Information association [DIA], USA; Career Award for Young Teacher from All India Council for Technical Education (AICTE), Govt. of India; Best Pharmaceutical Scientist of the Year, from the Association of Pharmaceutical Teachers’ of India (APTI) and many others.